under the guidance of Dr. Mac Lee Jean Louis, director of surgery. 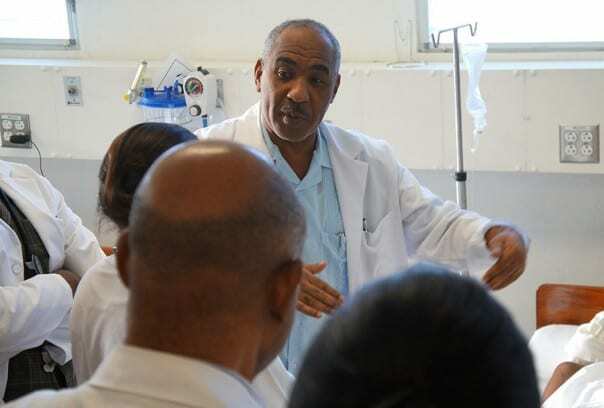 Dr. Mac Lee Jean Louis is the director of surgery at University Hospital in Mirebalais, which Partners In Health operates in partnership with Haiti’s Ministry of Health. Born and raised in Port-au-Prince, Jean Louis attended Haiti’s State University and did his residency at the General Hospital in Port-au-Prince. After more than two decades working in surgery departments in Brooklyn and Harlem, Jean Louis returned to Haiti to serve his country. Tell us about your role at University Hospital. As director of surgery, I coordinate all functions of the department of surgery and its specialty services, including urology, plastic surgery, pediatric surgery, and orthopedic surgery. What this means is that I oversee all of the surgical residents, and ensure coordination with doctors, nurses, and other staff members to make sure the surgery department is not only running, but running well 24/7. I make sure my team and I have the proper staffing, equipment, and resources to address the needs of the Central Plateau. From attending budget meetings to training surgical residents, I’m involved in anything that concerns the surgical department. I do rounds every morning at 7:30 sharp, during which we work with the residents to diagnose patients to figure out the best treatment for them. We ask patients frequently about their condition and symptoms. I also participate in grand rounds, which is a great opportunity for the whole hospital to come together to attend diversified lectures, discuss new technology, and learn about improvements in medicine in order to promote medical education. I also operate, but this is not my primary role; however, in challenging situations, I often offer my assistance. What made you want to return to Haiti? After the [Jan. 12, 2010] earthquake, I started to reflect on the situation of my country and my life. I was horrified with the living conditions. I initially thought it would be a great thing to help at some point in my life. I wanted to live a quiet life, away from any turbulence and worries. Then I saw the hospital, heard many good things about it, and learned about its plans to provide comprehensive and compassionate care. Then I thought I could become more involved. When I was offered the position, I had to really look at my life and see if this was going to be the right move. It was a lot to leave the life I had built for years, move in to the Central Plateau, and help with the building up of our surgery department. Money wasn’t the driving issue; I was attracted by the challenge of making the dream of creating a university hospital outside of Port-au-Prince a success. How has working at the hospital compared to your expectations? It’s a beautiful hospital, with hardworking and dedicated staff. We have a common goal, and we share similar ideas on matters needed for the continuing development of the hospital. Most important is that this hospital is filling a big need for the people of Haiti, and that it’s a model for the country. I like the fact that the hospital has a reputation within the community that it is here to serve. I love the fact that everyone is getting the same level of care, and that we are not just helping those who have something financially, but everyone. What would you like to instill in the surgical residents you’re training? I am trying to instill in my residents a spirit of ethical, accurate work in order to drive them to dispense compassionate and high-quality care. For them to know that patients will always be our No. 1 priority. I would like to set a standard level for them so that on their way out with their life, they should be able to perform at a scale that people and patients will look at them and wonder where they were trained. I am very tough on my residents. They may not understand me now, but I get the job done. I am not here to make friends or for them to like me. I am here to teach them modern concepts of surgery and hard work. I teach discipline and don’t promote any favoritism, and I don’t accept lateness or negligence. That’s not to say I don’t take care of my residents, because I do. I want them to get the most of this opportunity. I refuse to be held responsible for their lack of knowledge, because I provide them with the tools and resources to succeed. What role does surgery play in a referral hospital, and why is it important to you? I love this question—not because I am a surgeon, but because surgery is so crucial to a hospital. Health centers and clinics may not have surgery departments, but hospitals need them. Surgical services is one of the greatest reasons why people go to hospitals. Surgery is expensive; it requires expensive materials, instruments, knowledgeable staff, and skilled professionals. Bringing all of this together does cost a lot. However, there is such a great need here. I can’t just turn down a patient with a gangrenous foot. We perform so many surgeries a month that it makes me wonder, if this hospital wasn’t here, where would these patients go for care? I know some would just not go anywhere and they would not survive. To me, surgery is often the alternative between life and death. How do you feel about your work, as a Haitian and a surgeon? I feel excited, for three reasons. First, at a glance you wouldn’t know if this hospital was helping the poor or the rich. Because all patients are treated with respect and equity. University Hospital really is a hospital for the poor. Second, I am surrounded by a great team. I have yet to have an experience here where I asked someone for something, or told someone to do something and they haven’t done it. I have a team with a make-it-work attitude, which is what every director dreams of. When I am not here at the hospital, I know the job will still get done. Last, it’s personal. If I do anything, I need to be proud of it. I am proud to help my people. I hate failure, so when things are working I am happy. Here, I know I am doing something worthwhile. What’s the most difficult part of your work? Sometimes I get frustrated with my patients. I see so many neglected cases, which is the result of a poor health care system with limited access to primary care. Some of the patients we operate on have neglected their condition for so long that it requires more care than needed if the problem had been addressed early on. I often want to ask them—what took you so long to come to the hospital? We do more mastectomies in the surgery department, for usually late stage or advanced breast cancer, than elective hernia cases that have no complications. Rarely do we see cases in the early stages. It’s hard, but we have to help our patients not wait until the pain is unbearable. We have to help them understand that they can go to check-ups and regular appointments. I have been a doctor for over 28 years, and some cases still surprise me here on a weekly basis. I have to remind myself of my patients’ conditions and what they might be going through. The other day I was passing through the outpatient clinic on my way to the surgery ward, late afternoon, and the doctors were finishing up seeing their last patients for the day. As I was walking, I saw a very old woman who was walking slowly, so slowly that she couldn’t even look up. As I passed her, I stopped and asked her where she was going. She said she was leaving and that she had to come back the next day to see a doctor. I looked at her ID card, and it said she lived about 100 kilometers or about 62 miles from University Hospital, and she could barely get out the hospital door. I told her to sit as we looked into why she had to come back the next day. I found an attending physician who said they had called her name several times, but she was so slow coming to the front that they were never able to find her, and she was marked as absent. I did an initial intake and took her vital signs, and asked the doctor to give her priority. Many of our patients can’t read or write, so there are many barriers affecting patients getting access to health care. Do you miss your work and life in the United States? This is a simple life, too simple for a guy who has been living in New York for many years. Sometimes I miss New York. But working here has enabled me to reconnect with Dr. Jerome J. Defay, assistant director of surgery, and a long lost friend. We have been friends since medical school in Haiti, and after we finished we lost touch. He started a few months after me, and now we have breakfast together every morning, and we talk about everything. We make a good team; it’s been great working with him, and I trust him. Have your mindset or views changed after working at University Hospital? Before working here, I didn’t really understand Dr. Paul Farmer’s views on providing care for free to patients who can’t pay out of pocket. I always associated caring about your health with how much money you are willing to pay. But after working here and speaking with patients, I realize these patients care a lot about their health; they just don’t know how to manage their health or they can’t pay for it. Now I see that if patients were asked to pay a certain amount of money, some probably just wouldn’t come back because they can’t afford it. My mindset has changed, and I understand Dr. Farmer’s vision. My experience here has made me understand more, which I am grateful for. Every day I try to understand, because once you understand, you will never forget.